While some use social media just to connect with friends and have fun, many other people do it also for professional reasons. When your social media profiles look right, you are able to present yourself well not only to people who already know you but also to strangers or new contacts who are willing to learn more about you. Why is this so important? Because this could help make the networking easier. Sure, some people don’t need to build a big social media audience, but for most of us wide network is actually a great benefit. When you have enough contacts who know at least a little about you, you are able to ask for their advice, search for jobs using your social media, and so on. However, you have to be sure that your bio looks just right in order to achieve such results. So how exactly can you do so? You can figure this out with the help of my article. Today I want to give you some advice about how to make your social media bio look professional and appealing. Social media bios are usually quite limited by their size – and even if not, you still have to keep everything short if you don’t want your readers to get bored. That’s why you have to avoid being too abstract as well as telling things that don’t help your image at all. 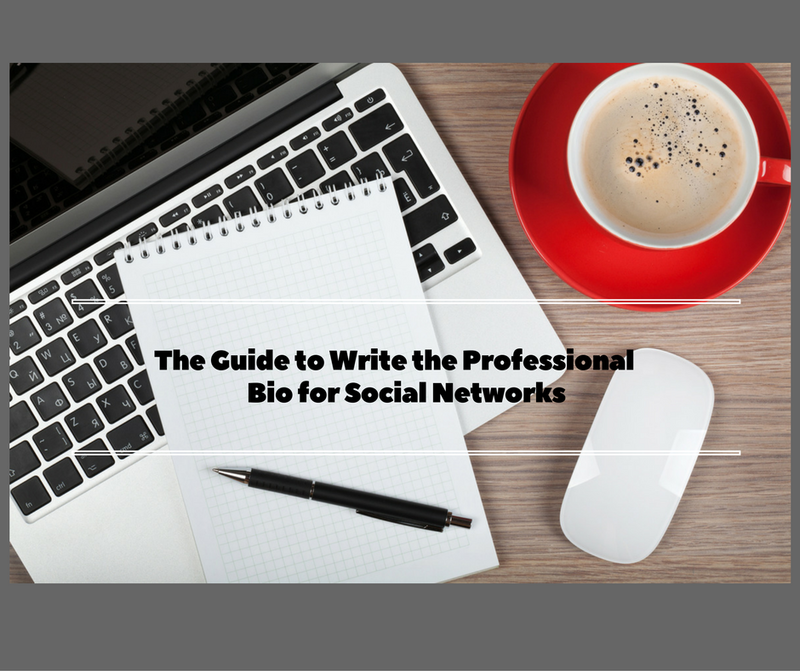 Be sure to keep in mind why you need a professional bio in the first place. If you are looking for potential employees, mention your work experience, try to be specific and keep short at the same time. If you want to change profession, focus on your skills instead of listing how many years you’d spend at the previous job. There’s no need to use complex lexicon unless you are willing to demonstrate your vocabulary skills for some reason. Be sure that your bio is not only interesting but easy to read. However, I’m not saying that you have to keep it primitive – you can and should use words from professional vocabulary when necessary. Just be sure to avoid wordiness. Speaking of simplicity, you have to avoid using hashtags too. While they were a trend some time ago, now they don’t look as bright and smart as before. You should think not only about people who add you on social media already knowing who you are, but also about people who might search for some professionals on social media. The best way to let the latter find you is to use relevant keywords. This doesn’t mean that you have to stuff your bio with keywords – no, use only the ones related to your job and skills, and try to be moderate. If there are too many, try to choose the most appropriate ones. I’ve seen so many people wanting to catch the attention of the others. This is their goal – the attention and the result. However, while striving to achieve this goal, many of them make one big mistake: they keep thinking about what they want to receive and don’t mention what they have to offer. It’s obvious that any employer or a potential client, or anyone else who is interested in networking with you, wants to see what they will receive in return. You have to catch their attention and to look interesting to them, so try focusing on that while you write your bio. There are different types of audience, and each one of them dictates the style you have to use. If your target audience consists mostly of young people, you are free to use jokes, Internet memes, etc. However, if your audience are serious professional people, you have to look professional too. That’s why try to come up with the main characteristics of your target audience to simplify your work. Maybe even try imagining your ideal target client – a person, who represents all of these characteristics. Try writing your bio while thinking of it and see what happens. Different social media bios have different requirements: for example, on Twitter it’s probably the shortest. Some people ignore these requirements, writing one bio for all profiles and shortening it when necessary, but I recommend writing a unique bio for every social media instead. Why? Because this way you’ll be able to focus on different things: for example, show your professional accomplishments on LinkedIn, be more personal on Facebook, keep it short and catchy on Twitter. Targeting your bio to every social media is just as important as using the right keywords. You also can go this way while writing the guest posts. Proofread every bio you write. It won’t take much time, but it will make your bio much more polished. Even a small typo can ruin the impression you’re trying to make, so try to make it as flawless as possible. Don’t forget about the photo: it’ll make your bio much more personal and professional at the same time. People like to see who they are communicating with, and a nice photo of you smiling can add value to your profile. As you see, in order to create amazing social media profiles you have to know your target audience well, to be able to focus on your potential visitors and demonstrate your value to them, to use keywords and to make all social media profiles different. However, simply creating them is not enough: you have to remember that every profile (even the best one) needs updates. So don’t forget to update them once in a while, adding all the new information that seems important to you. I hope that these tips will help you create the right bio for various social media and to establish new connections with the help of it. I wish you good luck! Richard Nolan is a blogger and a private tutor, sharing his experience in spheres of blogging, self-growth, and psychology. Richard writes for numerous blogs and gives useful tips for bloggers.